Purple Plum Fairy: BETADINE® FRESH BLISS FEMININE WASH: Keeping you fresh down there all day long! BETADINE® FRESH BLISS FEMININE WASH: Keeping you fresh down there all day long! Why should we use feminine wash? Should we use feminine wash? Is it necessary to use this? Should we use this daily? And we have answered these questions in this post for you. Basically, when we are talking about feminine wash’s necessity we should ask a simple question which can answer the riddle itself. Do we use the same Shampoo used for dandruff to control Oily hair or Hair Loss? Obviously the answer is “NO, we do not use the same shampoo for same here to treat different conditions”. Same logic can be applied here as our female private body parts are so much sensitive and need to be treated like one. We cannot simply use the same cleanser for all body part. We use Face wash and Body wash differently same way we need Feminine wash. I guess the basic is clear now. Betadine products don’t need any introduction. BETADINE®FRESH BLISS FEMININE WASH is available in two different variants: Pink Paradise and Lavender Dreams. I love the mild lavender smell of the latter. Like other products by Betadine, it balances the natural pH level that women needs. They are dermatologically tested and safe for sensitive skin. Using this product leaves you feeling fresh for a longer duration. It is not creamy and it doesn’t leave any sticky feeling behind. I'm really very particular about my personal hygiene. Of course, just like anybody, we all want to smell nice down there but still keeps the moisture that women needs sans that itchy dry feel. So what makes BETADINE® FRESH BLISS FEMININE WASH from the other brands you've used? It is delicately formulated for daily cleansing. It contains Anti-itch Avena Oats that helps soothe and prevent itching and Gentle Defense Lactic Acid to protect our intimate area from unpleasant odor and infection caused by fungi and bacteria. Let me share with you a little secret, my having type 2 diabetes would make me prone to female yeast infection. It is common among female diabetic patients to experience genital itching and burning because diabetes causes a higher glucose content in the urine--another extremely suitable place for yeast to thrive. Thus, it is important for diabetic women patients like me to keep a really good hygiene down there to prevent genital itch. For that part, I only trust products that will keep my V part protected. 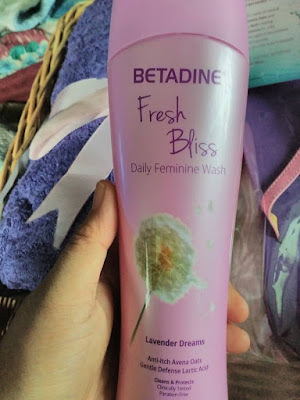 I use BETADINE® FRESH BLISS FEMININE WASH, it prevents bacteria and helps keep my private safe and protected. I love using it because it is formulated to be hypoallergenic and does not in any way irritates my sensitive skin. The best part? It's Pareben-free. So we can all be assured that it's safe and dermatologically-tested and approved. 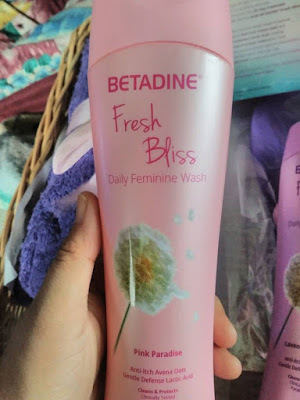 Betadine Fresh Bliss will leave you fresh and clean all the time. 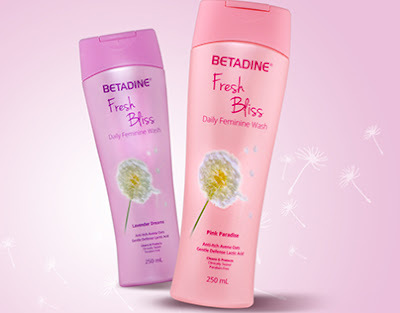 Betadine Fresh Bliss is available in 60, 150, and 250ml bottles.